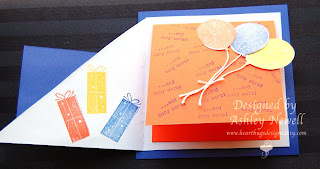 This is a card I made for Dustin's 27th birthday, not the 27th card I made for Dustin's birthday. However, that kinda sounds like a cute idea. Maybe next year, if I get really creative, I'll make Dustin 28 cards for his 28th birthday. Or maybe I'll start with Brady since he'll only be one this year. Hehe. Anyhow, I started with a tutorial for a two way open card. I thought the idea was really neat. You can see how the card opens in my second picture. I really wanted to do something special for Dustin's birthday and this met that requirement for me. Then I took Dustin's favorite colors, blue and orange and kinda went wild with it. I added the yellow because there is some yellow in the patterned paper I used. I cut out the balloons and attached some real string to them for some texture. I paper pierced the icing on the cake so that it would use both of the colors I wanted. I stamped the sentiment, the presents, and the orange paper. I really did want to make a masculine card but it was just begging me for some more embellishment, so I added a brad that kinda looks like a flower. But I think overall, it's still pretty masculine. Dustin told me it is the best card he's ever received. I thought that was pretty sweet of him to say. He even took it to work to display at his cubicle. I'm very proud and glad he likes it so much! 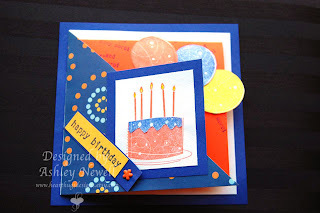 Wonderful masculine birthday card ... love those fun colors and the stamped background.